I very excited about tomorrow. 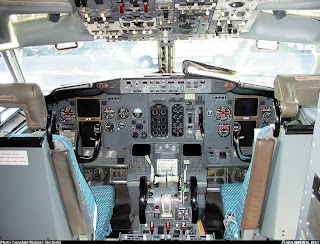 From tomorrow onward I would be attending training classes to learn about flying Boeing 737-400. This training would teach me how to do takeoff, landing (day and night) and communication during the flight path for Boeing 737 jet. However, the most challenging and exciting part of this training is on the fifth day, where I need to fly the Boeing 737-400 from Bangalore to New Delhi on my own. Now, If you are surprised about this, then don't worry. They are not gonna allow me to fly a real Boeing 737 in just five days. Actually I am gonna do this in a Boeing 737 flight simulator. 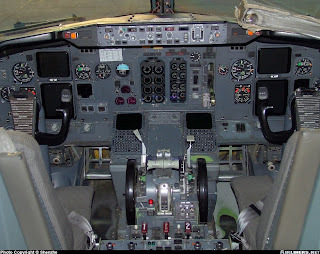 However, this is a state of the art simulator, and includes both hardware and software from Boeing 737-400 aircraft. Yeah, I know, these cockpit photos looks messy & scary, but I guess I can cope with them.